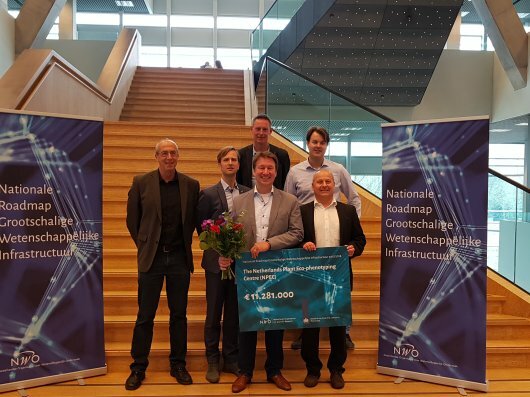 On April 12, the Dutch minister of Education, Culture and Sciences announced the funding of Netherlands Plant Eco-phenotyping Centre (NPEC) as part of the National Roadmap for Large-scale Scientific Infrastructure of the Dutch government. The NPEC facility is an initiative of Wageningen University & Research and Utrecht University. NPEC provides a versatile modular platform that will enable Dutch and international scientists, botch academic and R&D, to carry out accurate high-throughput phenotyping: studies of plant performance in relation to relevant biotic and abiotic factors across a range of scales, from molecule to crop, from nm to km. NPEC is an integrated, national research facility housed by Wageningen University & Research and Utrecht University and is co-funded by The Netherlands Organisation for Scientific Research (NWO) for 10 years with a contribution of 11 million euros. The total costs of NPEC amounts up to 22 million euros. The team with its prize. NPEC comprises six complementary, experimental modules. In the precision mesocosm–level ECOtron (ECO) plant-plant and plant-microbe interactions both above- and belowground will be studied, at a level of cm to m.
The Plant-Microbe Interactions phenotyping module (PMI) will be used for high throughput research on plant-microbe interactions, from the molecular level up to plant organ level. The Multi-Environment climate chamber module (ME) has been designed to study the molecular basis of plant responses to multiple environmental factors. The High-Throughput Phenotyping climate chamber module (HTP) allows for automated, high-throughput screening of plant genotypes under highly controlled environmental conditions. In the GreenHouse phenotyping (GH) module, integrated whole-plant phenotyping will be carried out, testing numerous crops, from seedling to harvest. The Open-Field phenotyping (OF) module provides an outdoor mobile drone- and vehicle-based phenotyping system that can study individual plants in small plots or large fields. Within NPEC, automated systems will collect information on the plant phenotype. Digital plant phenotyping is a relatively new domain within plant sciences, and rapid developments are taking place in the field of non-destructive, image-analysis-based phenotyping that allow for a characterization of plant traits in high-throughput. Plant phenotyping refers to a quantitative description of the anatomical, physiological and biochemical properties of plants. The phenotype emerges based on a combination of the genotype, determined by the DNA sequence, and the environment in which a plant grows. The DNA sequence can nowadays be relatively easily obtained, and at affordable costs. The environment comprises all external biotic and abiotic aspects that influence plant growth, so including pests and diseases, the weather, the soil, but also crop management. 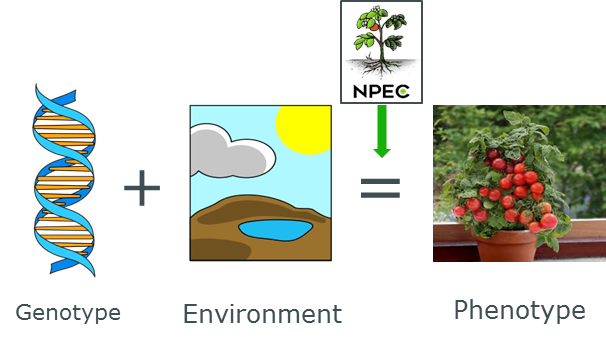 NPEC focusses especially on the understanding of the impact of the environment on plant growth and generates a wide range of different plant phenotypes. NPEC enables large-scale and high-precision monitoring to generate data for better understanding of plant-environment response, and its genetic control. NPEC offers multi-scale phenotyping to analyse plant performance under diverse environmental conditions and to characterise the traits contributing to performance in these multi-environment scenarios. NPEC will allow the study of plants in relation to biotic and abiotic factors, including plant-microbiome interactions, plant-plant competition, plant diseases and exposure to a multitude of variable abiotic environmental conditions, such as light quality, irradiance levels, nutrient supply, temperature, humidity, soil pH and atmospheric CO2 levels. The performance of plants (i.e. root and shoot system development and architecture, disease resistance, herbivore attraction, irradiation use efficiency, water and nutrient use efficiency, plant-microbiome establishment, etc.) can be examined using a range of sensors, providing data from the molecular level to the level of field crops and ecosystems. Initiated by Wageningen University & Research and Utrecht University, NPEC will serve the Dutch and international academic community and private enterprises interested in eco-phenotyping research. Dutch plant sciences research groups, more than 50 companies and several international research institutes and universities supported the NPEC proposal and expressed their interest in acquiring access to the platform of enabling technologies provided by the facility for their research. Breeding companies, farmers and growers also have the need to understand and exploit this interaction to maximize their productivity and yields. Wageningen University is the only university in the Netherlands to focus specifically on the theme ‘healthy food and living environment’. We do so by working closely together with governments and the business community. Big data in de melkveehouderij; hoe zit dat eigenlijk?